Are you planning on visiting potential transfer schools before deciding where to apply? Before you go on a campus tour, read these tips. Most college tours include a group question/answer session with an admissions representative, a guided campus tour, a peek into a dorm and a meal at the best dining hall. To get the most out of your college tour, call ahead to make sure you get the VIP treatment. Ask to have a tour of the department you plan to major in. Contact the admissions department when making your campus tour requests, and while you’re at it, see if you can attend a class or even stay overnight on campus. Let admissions know that you’re a transfer student. There might be special activities or tours just for you. 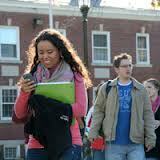 Your college tour guide will most likely be a student at the school who is trained to answer your questions. What does your guide think of the professors? Are they easy accessible? Where do alumni get jobs? What kinds of clubs are on campus? Can they put you in contact with other transfer students? But don’t limit your information-gathering mission to your campus tour guide! Find some random people to talk to at the bookstore or cafeteria. After all, the students remember when they, too, were trying to decide on a school. One recent grad, curious about the buildings on her campus, made a point to visit at least one bathroom in every building. Her Grand Bathroom College Tour gave her a reason for being in buildings she wouldn’t have otherwise visited. As a prospective student, your purpose is clear without needing the bathroom tour excuse. Don’t be afraid to peek into the chem lab or computer facilities to get a clear picture of campus offerings. Take advantage or your prospective-student status by also asking student guides to see more dorms, dining halls or computer labs than you may have seen on the mass tour. Without asking to see more, you might be shown a blue-ribbon dorm without realizing that transfer students are stashed across town. You know how it is when you meet a bunch of people in one day? By the end, you can’t remember their faces, let alone their jobs, hometowns and names. The same kind of black hole will form if you try to cram more than two college visits in one day. The programs, professors and perks of each will seem like one big blob of information. Save yourself the stress of making multiple appointments, and keep your visits to just a couple each day. Definitely consider the campus activities you saw, the students you met and the overall feeling you got while on your campus tour. But also remember that spending a day on a college tour is a totally different experience than spending two years there. The best advice when visiting college is clichéd but true: Keep an open mind. You might have a less-than-stellar college tour guide, it may rain or snow on your visit, or maybe you caught a professor on a bad day. So while a campus tour is a must and your gut’s a good thing to trust, don’t be afraid to give a place a second chance. Money Cities are notorious for burning holes in students’ pockets. Count on everything from rent to food to entertainment being much more expensive in the city than in rural areas. Transportation Though some rural college campuses do have public transportation systems, it is generally more convenient to have a car on campus. Buses, trains, subways and taxis are the easiest ways to get around in cities because parking is at a premium. Security Most colleges, whether rural or urban, make student safety a priority. But sometimes it can be difficult for someone from a small town to feel secure in a city environment, just like a student from the city might feel daunted by the openness of a rural campus.